Quilt There are 6 products. Synthetic quilt, 4 seasons, 100% percale cotton luxury envelope, 100% polyester (siliconized hollow fibers) interior. The 2 duvets (a 200gr/m² and a 350gr/m²) are connected by snaps forming a 550 gr/m² quilt. Anti-allergic and washable at 60 ° C. Follows body shapes flexibly. White 4-season duvet in white 90% down and 10% Poland goose feather, 100% Mako cotton wrap with Medicott treatment. 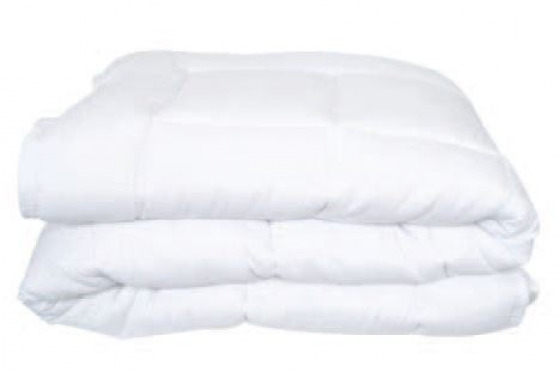 Pack of 2 duvets: a duvet for the light summer with piping white satin. And a duvet for the autumn of average seasons with silver satin piping. 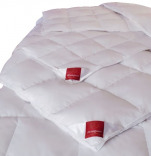 The 2 buttonhole-linked duvets offer a perfect warm duvet for the winter. Washable at 60°C. White classic duvet in white 90% down and 10% Poland goose feather, 100% Mako cotton wrap with Medicott treatment. The classic "light, medium or warm" duvet is sold individually and can be combined later if necessary with one of the other duvet of the same range by an easy buttonhole system. Washable at 60°C. Luxury duvet 100% new white Masurian goose down, 100% Mako cotton wrap with Medicott treatment. The luxury "light, medium or warm" duvet is sold individually and can be combined later if necessary with one of the other duvet of the same range by an easy buttonhole system. Washable at 60°C. This quilt in 100% cotton (padding, inside) and in 100% luxury cotton percale (fabric, outside) is ideal as a summer duvet. Quilt : natural, strong, breathable, able to absorb 20% moisture and antiallergic. Washable at 60°C and dryer allowed.